3.	Who is your favourite football team? ~ Barcelona! 11. What is your favourite football skill, and can you do it? ~ Ronaldinho instant first touch, yes I can do it... sometimes! Proud Dad, Marc told us: James really enjoys his sessions with Owen, his very clear explanations of what should be done is easily understood and the fun, friendly atmosphere is clear on all of the boys faces! Thank you very much for taking the time to chat to us, James. It's always a pleasure to have you with us. How do you find the time though, between all of your activities? Do you ever sleep?? Ha! Keep on aiming high! 2. Tell us about you and your family: ~ We are a family of 5. Life is very busy but we always make time for HFSA every Saturday! 3.	Who is your favourite football team? ~ Jacob & Louie both agree on Barcelona! 6. When did you start your football journey with the Academy? ~ From the very first week, when Owen started his new business HFSA! 8. Do you play football in a team? ~ Jacob - Yes. 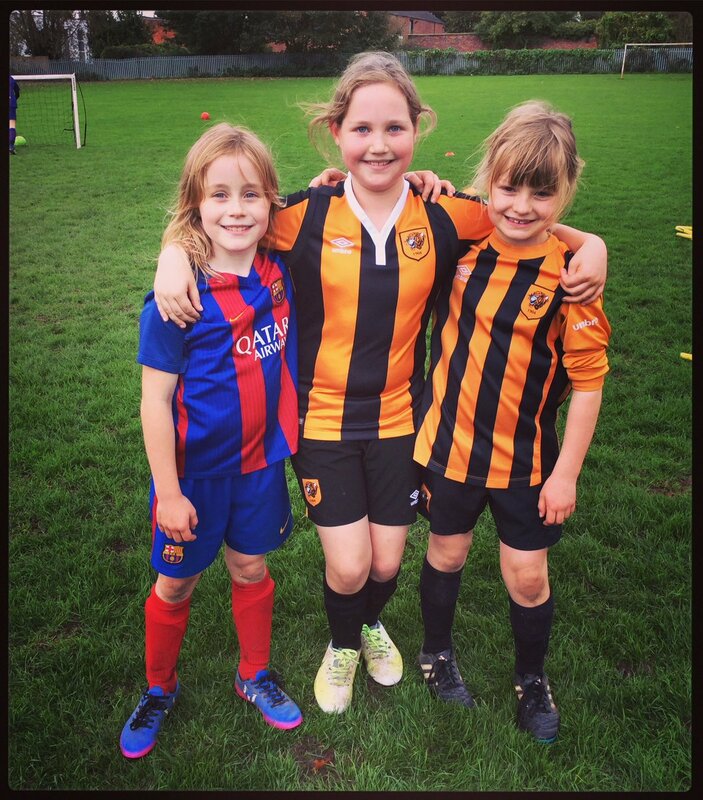 Hessle Sporting Tigers. Louie - I am desperate to find a team! 11. What is your favourite football skill, and can you do it? ~ Jacob - Maradona turn & Rainbow flick – I can do Maradona turn when playing but I can only do a Rainbow flick in training when stood still. Louie - Rainbow flick but I can’t do it yet! Harry - Scoring and Dabbing LOL!! 12. What other activities would you like to see at HFSA? ~ Louie - I would like a trophy and medal & certificate at the end of the term! 13. What advice would you give to someone new wanting to join us? ~ Jacob - Just turn up with the appropriate footwear and shin pads! Louie - It’s difficult at first but when you get the hang of it, it’s easy! Owen shows us the skills first and then we have a go. Harry -It’s fun! We asked Mum Emma and Dad Simon if they wanted to add anything. They said: Owen is a brilliant coach! He has the skills and knowledge to teach the children. He develops their confidence, both physically and socially. He has a firm but fair approach with the children and he always makes the sessions interesting and fun. We attend all three sessions on a Saturday; each session matches the age and ability of our children. The children and parents that attend HFSA are very friendly too. We would definitely recommend the Academy to others! Massive thanks go to the Charlesworth-Bannister family. It's always a pleasure to see the boys and their beaming smiles, week in and out. We also love that it's a real family affair. Keep up the hard work, boys! We asked Tom's parents if they had anything to add. 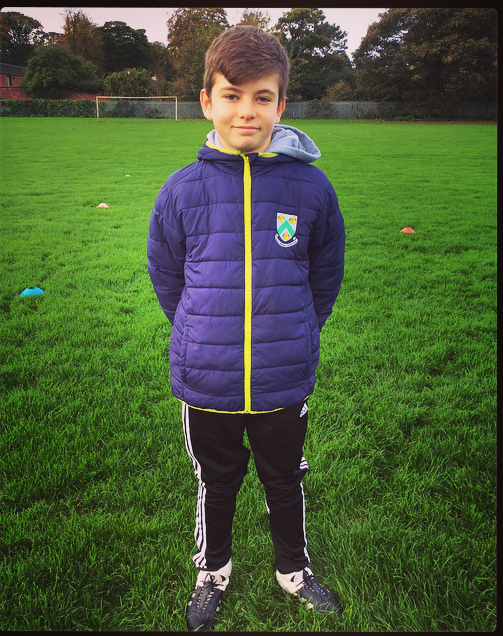 This is what Paulo & Susan had to say ~ We are always recommending Owen to friends whose kids play football as we think the discipline and coaching is really excellent. Tom started with Owen when he was little and really developed under his tuition. He has learnt so many skills from him, which has given him confidence in his playing during Sunday League matches. He is also the captain of his school football team (Trinity House Academy) and when he isn't playing football, he is either watching it on TV or playing Fifa! Huge thanks to Tom and his family for taking part. It's quite clear that Tom has such a passion for football, that there's no wonder he has little time for any other hobbies. Tom, well done - you will go far! Lastly, THANK YOU for all your hard work with the Academy. If you have a daughter who is keen to step into football boots, please do give us a call or click on the "Contact Us" tab. We'd love to have them join the HFSA family! 3.	Who is your favourite football team? ~ Both: Ipswich! 7. What made you stick with HFSA? ~ Ewan: I like it! Luke: It's fun! 11. What is your favourite football skill, and can you do it? ~ Ewan: Rainbow flick, yes I can do it. Luke: Backheel. Yes! 12. What other activities would you like to see at HFSA? ~ Ewan: Shooting practice. Luke: I can't think of anything else! 13. What advice would you give to someone new wanting to join us? ~ Ewan: Just come along and enjoy yourselves. Luke: It's fun, so come and join in. 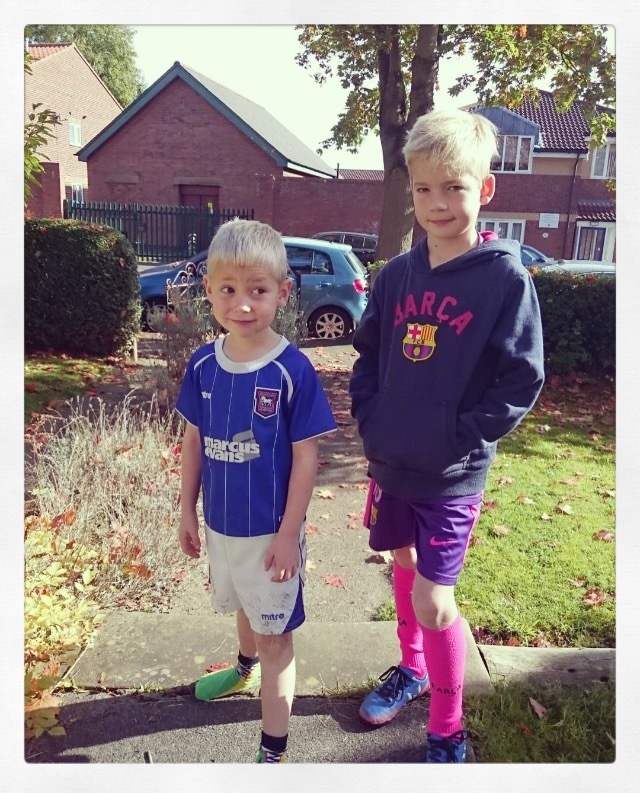 "Both our boys really enjoy going to HFSA, even if Luke gets a bit upset when he doesn't win! Owen is a great coach and he puts on good sessions with varied activities. It's helped Ewan and Luke not just learn about football, but about teamwork, listening and much more. 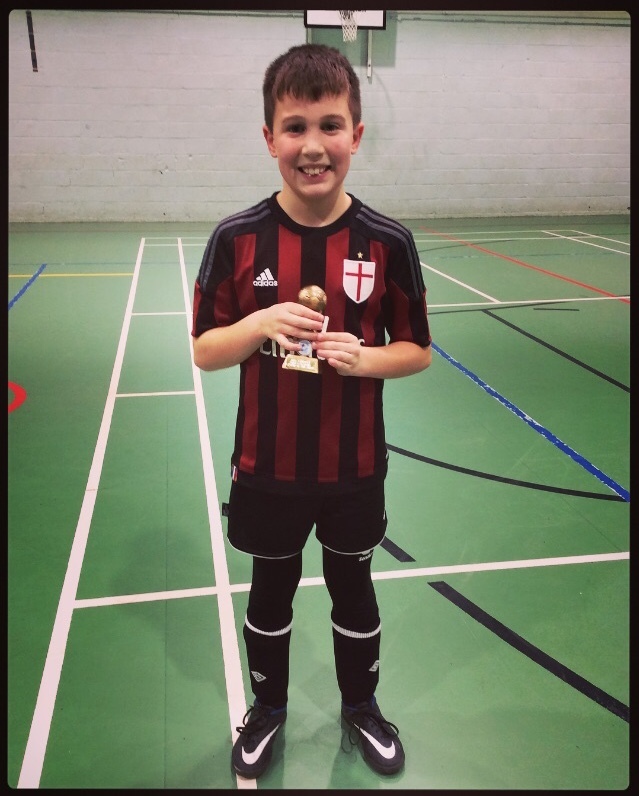 Owen's coaching has helped Ewan develop the skills and confidence to start playing for a team (Hessle Rangers Colts) last year and fit right in. Although Ewan trains once a week with the team he didn't want to stop going to HFSA too. One of the things we like is that there are a range of ages in each session. Although it can be daunting for, say, a 9 year old to play with 11 and 12 year olds, I think they learn a lot from the older boys in the session and it develops them more quickly. They're certainly better footballers than their Dad was at their ages!" We really hope you continue to enjoy your football journey for years to come, boys. A big thank you to the White Family for participating!